Edition Type: Open Edition Size Type/Largest Dimension: 8 1/2" x 11"
Compelling antique era painting. It features a 19th century Jewish rabbi carrying the Torah or "The Scrolls of the Law" showing his emotion and great love for God's word. 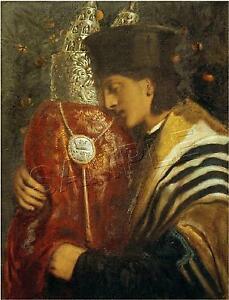 He is wearing a Jewish prayer shawl or tallis and epitomizes the wisdom and knowledge befitting his position.